Per his request, this is what I strapped in and drove to Ethan’s third-grade class today for Show and Tell. Because my minivan wasn’t cool enough. In case you’re unimpressed, might I suggest that this sweet-faced stuffed teddy is no small force with which to be reckoned? It is hairy and heavy. I hauled it from Ethan’s bed, down the stairs, into the car, out of the car, into the school, through the library (my special shortcut), and into Mrs. Smith’s third-grade classroom–all by my lonesome. Upon seeing me in the hallway, Ethan shot up from his chair like a rocket, leapt over several desks (and kids) to get to me, wrapped his skinny arms around the wooly mammoth and drug it across the (awful, sticky, germ-ridden) carpet. He made his way to the front of the room and introduced “Beary” to his already-infatuated classmates, smiling magnanimously at their enamored oohs and ahhs. Every hand went up with questions about the Great Big Bear, but since only three are allowed to be answered at Show and Tell, Ethan chose his questioners carefully and answered them wisely, looking down on his subjects with the wisdom of Soloman. His admirers wanted to know: where did he get Beary, how much did she weigh, and could their Moms still find them one for Christmas? Ethan informed them: from my big sister who didn’t want it anymore, I don’t know–a lot, and I think your mom could probably get it at Costco. (I didn’t have the heart to tell them this last one wasn’t true. This bear is so 2011.) The kids nodded, satisfied and impressed, and it appeared that Ethan’s lifelong dream had finally come true: he had minions. Ethan’s lifelong dream had finally come true: he had minions. The balance of the hour was spent with Ethan, Beary and me sitting around a table in the wet area enjoying our lunch. I hung my volunteer badge around Beary’s neck and Ethan beamed through his pb&j every time a fellow third-grader walked by and said, “Whoa, check out that bear!” Then, when lunchtime was over, Ethan did something so rare it was almost unbelievable: he gave me a loud kiss on each cheek and a hug, and then another hug, in front of his friends. 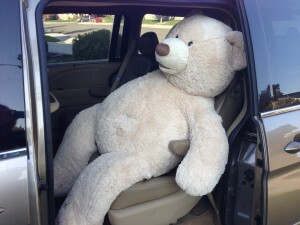 “Thanks for bringing Beary!” he said, still smiling, then hopped off to his classroom. I leaned back in my chair and folded my arms, looked across the table at the Beast, and sighed. This school year has given me one daughter starting high school and another navigating middle school–with all of the angst and drama that that implies. I love my girls and I love their ages, but today I decided that what I really love is Show and Tell. If only Beary worked on teens and tweens. I’d strap him down and drag him anywhere. Next Article Our Sunday night dinner.